We are not strangers to the online program called Reading Eggs. In fact, we just used it last year and my little ones really enjoyed it. They've really changed things up for the positive the last few years and now they came out with workbooks that go along with the online program! We decided to review 200 essential Reading Skills for Second Grade. They have books from Kindergarten to 5th grade as well as math books for Kindergarten through 2nd grade. If you are not familiar with Reading Eggs program, they have an online program with a few different areas. They have a Reading Eggs Jr for ages 2-4, Reading Eggs for ages 3-7, Reading Eggspress for ages 7-13, as well as a Mathseed area to work on math. We were excited to see what their new workbooks were like and we weren't disappointed. The workbook is 217 pages long. The student only has to complete one page a day which takes about 10-15 minutes. We were impressed with the sturdy pages and how colorful it was. This particular book coincides with Reading Eggspress. Each day of the week is broke down into a different area of language skills and each of them are color coded. Day 1's comprehension has you reading a short paragraph and making "think marks" to point out different parts of the story. This usually involves drawing circles, boxes, squares or underlining things. Sometimes even coloring part of a sentence. Then it ends with circling answers to questions about the passage. Day 2 again has you reading a passage and using different think marks but this time it ends with the child writing an answer to some comprehension questions. Day 3 focuses on working on spelling words. They have a list of words that the student copies, unscrambling words and writing names to pictures. There is also a little lesson box that teaches the student certain spelling rules. Day 4 still works on spelling but in different ways. There are challenge words they have to copy which were harder than the previous day and they then need to write out a silly story using them. Day 5 of grammar works on teaching different parts of speech such as nouns, adjectives, verbs etc. While I listed some of the activities involved in each of the different areas, there are many more that the workbook does, we just haven't gotten to them yet as this workbook is intended to last the full school year. Each page has little boxes off to the side that give either directions, or different learning information. In the back is a handy answer key so there is no seperate book for answers or no having to guess if the child got it right. In the front of the book, it breaks down week by week what the child will be covering in each lesson. There is also another section that gives you the year at a glance. 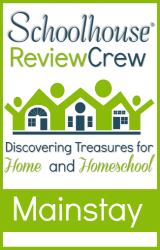 Included is also 4 reviews that help show you their growth throughout the year and what they are learning. While we waited for our workbook to arrive in the mail, we received a PDF file of the workbook to pring out pages to get started. 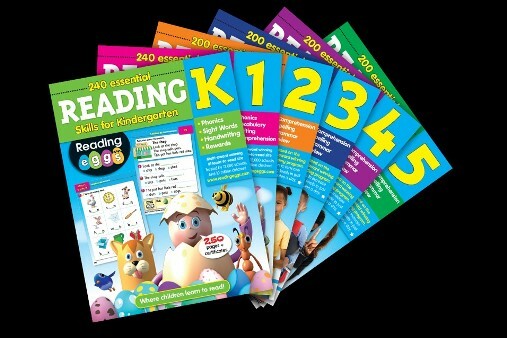 We also received a 3 month membership to the online Reading Eggs programs. Since it had been awhile since we last used it, my daughter took the placement test and got started right away with the online portion. She was able to navigate the website on her own once I had logged her in. She loves how engaging it is. We ran into an issue once where the program didn't advance her correctly. A simple email to customer service had it resolved with in a day. They were very accomodating. With the workbook, I would sit down with her once a day to complete her daily page with her. I would definitely say the second grade workbook is a solid second grade reading level, maybe even slightly more of a later second grade so there were still some words I had to help her with. This is definitely a book I plan to keep using this year as it covers in depth, grammar, reading, and spelling skills in just a short lesson a day. We really liked that it wasn't a long or boring lesson and it was neat how it could be used along side the online portion of their program. 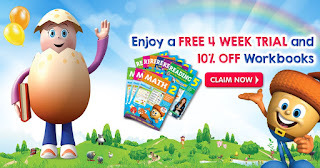 In fact right now, you can get a free 4 week trial of the online program in addition to my readers getting 10% off any workbook using the code WK10V7M4D5P. My name is Jenn & I am a homeschooling mom to 8, beautiful kiddos that God has blessed me with. I started this blog during one of the darkest times of my life when I found out my son was going to die. God has been using our journey for His glory! I continue to write about our everyday life as I try to live out our "new normal". More can be read under Noah's story. Please feel free to contact me if you are facing a fatal prenatal diagnosis, have lost a baby, are supporting someone who has or just need a listening ear and prayer.